2.Our lens hood keeps stray light from entering your shot. The reversible cone also protects against dust and fingerprints. 3.Made of high quality ABS,strong,durable and easy to use.just push to snap on, pull off. Can be used with a filter also. Durable plastic. On close-up shots can create a circular pattern around image, on telephoto shots this does not occur. 4.We have many sizes and models of lens hoods just choose the one compatiable with your camera. WHAT IS THE PURPOSE OF A LENS HOOD? The lens hood is a piece of plastic that clips onto the front of a camera lens and extends beyond it. Lens hoods serve two primary purposes:reducing lens flare, and protecting the lens from damage. 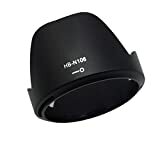 The intended purpose of the lens hood is simply to reduce lens flare, but the protection it provides to the glass elements of the lens is a beneficial side-effect. SHOULD I USE A LENS HOOD ON MY CAMERA? While shooting without a lens hood can still produce great pictures most of the time. if any light happens to bounce into the lens from the sides, the contrast and color in the image is significantly reduced. Also, it is nice to have a lens hood for protection of the lens. This entry was posted in Discount Photography and tagged 1855mm, f/3.55.6G, Flower, HBN106, Hood, lens, MultiModel, Nikon, Tulip, WARRAH by Ball Photo. Bookmark the permalink.